Studio-quality 2 in x 2 out USB audio interface and microphone for iPhone, iPad, Mac. ONE is designed for easily creating professional and amazing sounding recordings on your iPod touch, iPhone, iPad or Mac. Using Apogee’s premium AD/DA conversion, ONE produces pristine music, podcast, and voice-over recordings while also delivering audiophile quality sound to your headphones. ONE for iPad and Mac features special circuitry designed to deliver professional performance for iPad use and low latency USB 2.0 performance for Mac. Charges iOS device. The only interface that charges iOS devices while in use and can also be battery powered. Computer: Intel Mac 1,5 GHz or faster. Memory: 2 GB RAM minimum, 4 GB recommended. Connection and power: any available USB port on a Mac. USB bus powered; DC power optional. (DC power supply included). iOS version: 6 or greater. Power supply or two AA batteries required (Batteries not included). iOS device compatibility: iPhone 7 Plus, iPhone 7, iPhone SE, iPhone 6s Plus, iPhone 6s, iPhone 6 Plus, iPhone 6, iPhone 5s, iPhone 5c, iPhone 5, iPad Pro (9,7”), iPad Pro (12,9”), iPad Air 2, iPad Air, iPad (4th generation), iPad mini 4, iPad mini 3, iPad mini 2, iPad mini, iPad (4th generation), iPod touch (6th generation), iPad touch (5th generation). Any Mac Core Audio compatible application. Recommended apps: Logic, GarageBand, MainStage, Final Cut, Pro Tools, Ableton Live, Digital Performer, Studio One, Cubase, and Nuendo. Any iOS Core Audio compatible app. Recommended apps: GarageBand, Auria. Built-in omnidirectional condenser microphone (mic stand adapter included). XLR microphone and 6,3 mm jack instrument connector on breakout cable. 2 simultaneous inputs (instrument + built-in or external mic). Mic preamp with up to 62 dB of gain and selectable 48 V phantom power. 3,5 mm stereo jack output for headphones or powered speakers. A/D and D/A conversion: 24 bit/96 kHz. 0 to 62 dB gain. 14 dBu max input level. 0 to 45 dB gain. 14 dBu max (3,9 V RMS). Dimensions: 160 x 57 x 30 mm. 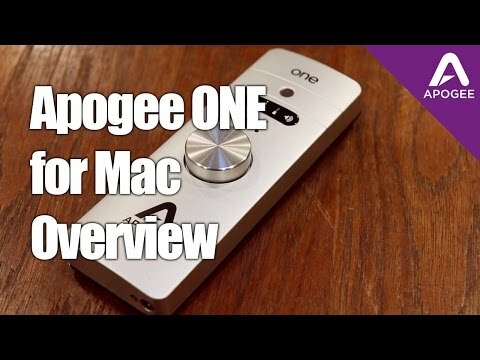 Do you own Apogee Electronics ONE for Mac + iOS or have you had a chance to try it?